Always Be Closing. ABC. It is the beauty of selling on Amazon that you can be closing sales and moving product, regardless of where in the world you are or how you are spending your time. I have been in Asia for the past few months, and haven’t had much time to devote to Jungle Stix, so a product update would be good now. We have been keeping a collection of all previous updates on Jungle Stix on our Collaborative Launch page, which is a great way to catch up on every detail from the past year that lead us to this point. Jungle Stix has been cruising along nicely so far. 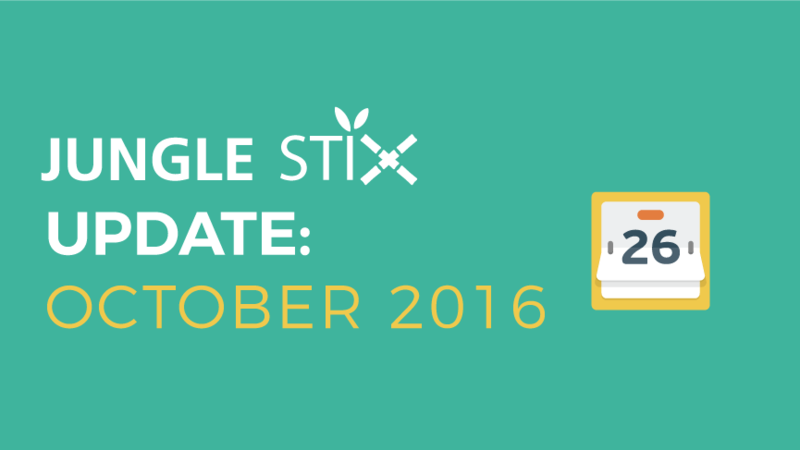 October was a strong month for Jungle Stix. Not an all time best, but strong performance with a lot of gas in the tank to continue growth for the foreseeable future. Let’s take a look at the specifics. 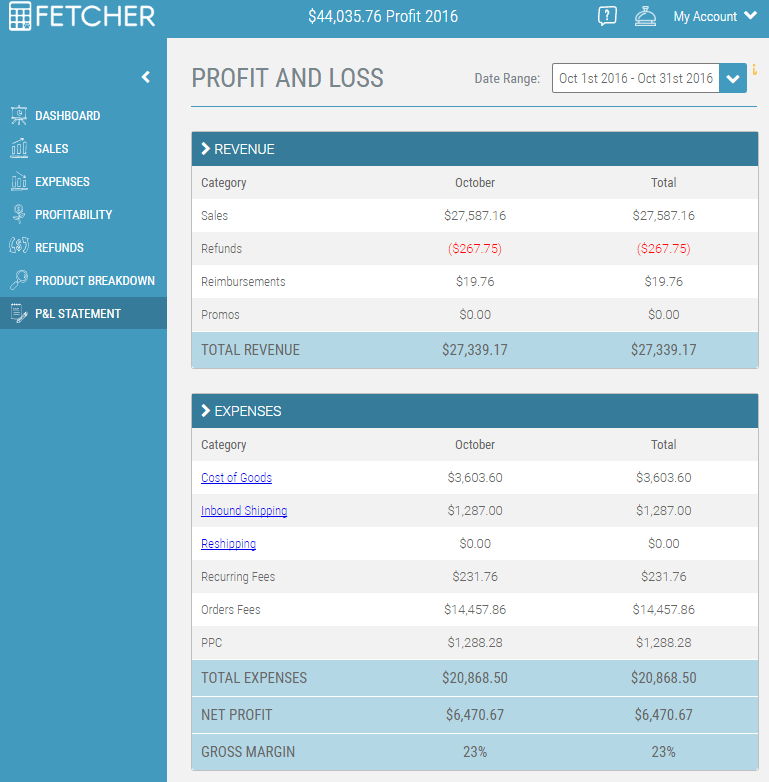 Oh, a quick note: these screenshots are from Fetcher, a new Profit Analytics app for Amazon sellers that we have just launched. 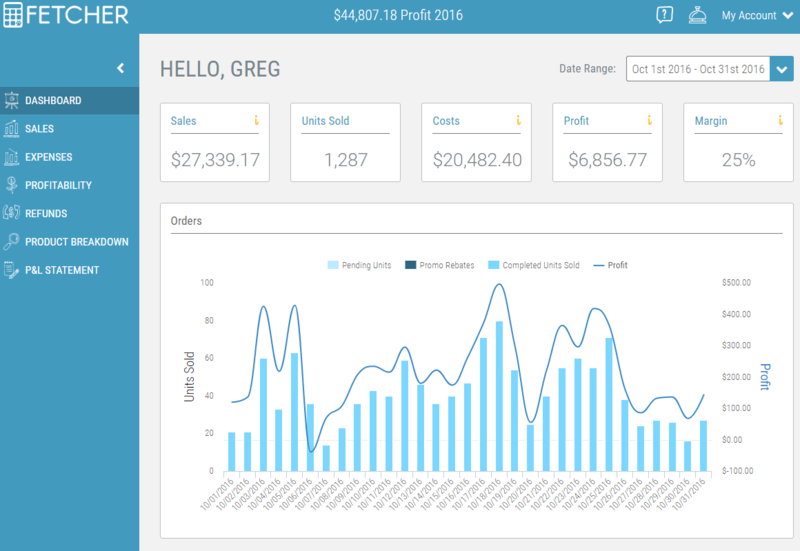 I have been using it every day as it is a much cleaner and more intuitive dashboard than Amazon’s Seller Central digital maze. We have a free 31 day trial, so feel free to give it a spin for yourself at no cost. The figure that jumped out to me was the 23% Gross Margin figure. Quite literally, the bottom line. This skewed lower than our Year-to-Date figure of 25%, and lower than the previous month of September. Sometimes it is hard to understand these numbers in isolation, so I like to do a side-by-side comparison. Let’s compare September 2016 to October 2016, because we did so well in September. Top line sales dropped about 12% from September to October. 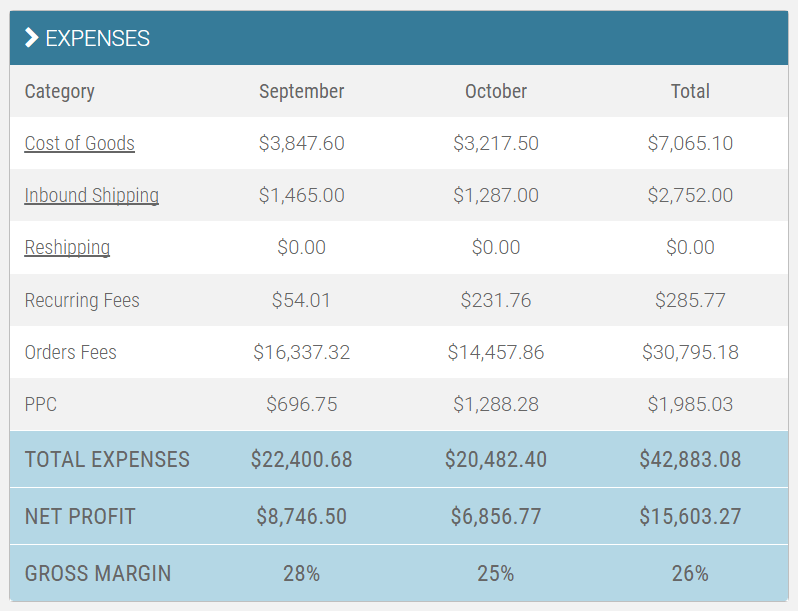 Moreover, our expenses as a percentage of sales was higher in October, which is the difference for the decreased Gross Margin. When digging into my profit analytics, I like to isolate two time periods of interest and do a line-by-line comparison. Are there any abnormal figures that appear to be outliers? Was there any particular event during either of these months that would effect consumer behavior? Are there any concerning figures that warrant a deeper investigation? Where can these numbers be improved? How can we cut down on the expenses to improve gross margin? As you can see above, a bulk of the expenses are “Orders Fees”, which are all of the Amazon fees. It is pretty hard to alter that–our product is the size and weight that it is, no changing that. However, I have been trying to improve the Cost of Goods sold by improving the manufacturing and shipping costs. Right now, we are slightly under $4 per unit landed cost. Every penny that I trim with either the Cost of Goods Sold or Inbound Shipping Cost essentially goes to the bottom line. There were several learnings from October which I want to share. We saw a slight drop in overall sales in October, as compared to September. This struck me as slightly surprising. I was expecting that we would see a lift in sales in October with the seasonality of the product. To answer my question above of any atypical events in October, many of you may know that Amazon changed its Terms of Service, disallowing incentivized reviews. This means that no longer could sellers give away discounted products in exchange for product reviews. There was additional fallout to this change. Namely that some previously acquired product reviews were removed by Amazon. Jungle Stix was effected by this. We had nearly 200 product reviews at the beginning of October. Now we have 109 reviews. The number, and rating, of product reviews has a direct influence on conversion rate. Shoppers see social proof in a product that has a lot of strong reviews, and therefore are more willing to purchase those products. 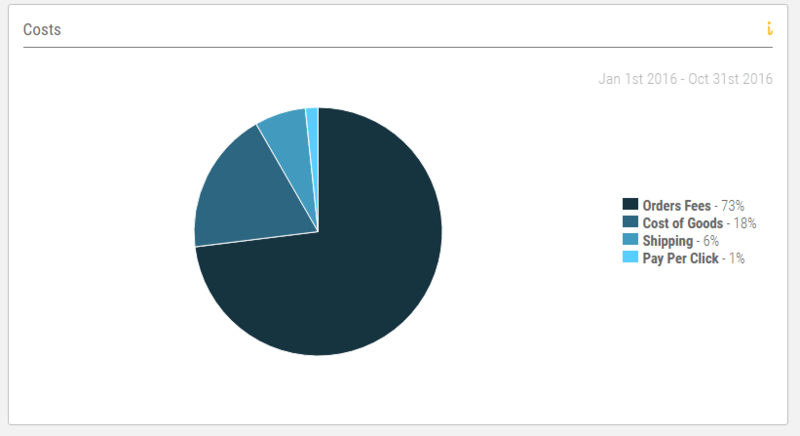 So how was our conversion rate effected by our decreased product reviews? To understand the change, I looked at the conversion rate of any visitor on our page before the Terms of Service change and compared to afterwards. 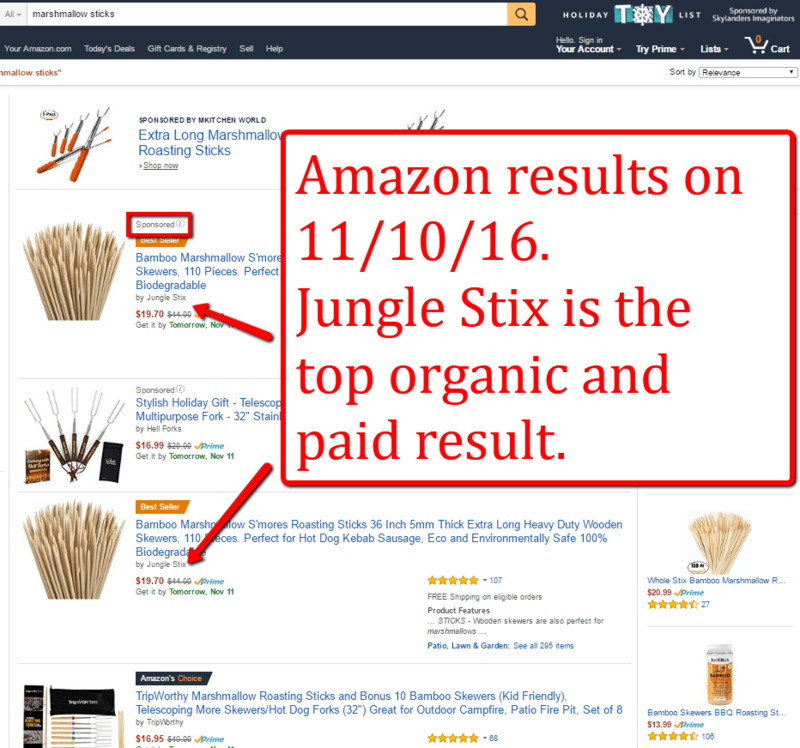 Jungle Stix lost reviews since the Amazon TOC change, but conversion rate was not significantly impacted. Overall sales are down significantly between these two time periods. $6739 for pre-TOS Change vs. $3849 post-TOS Change. This could be related to any number of reasons (less customer demand, a competitor running a promotion or sale, seasonality, etc). However, we can rest assured with this small sample size that our conversion rate is not significantly impacted by the lost reviews, at this point. As you can see above, we are still running our Pay Per Click campaigns aggressively for the keywords that are most relevant. 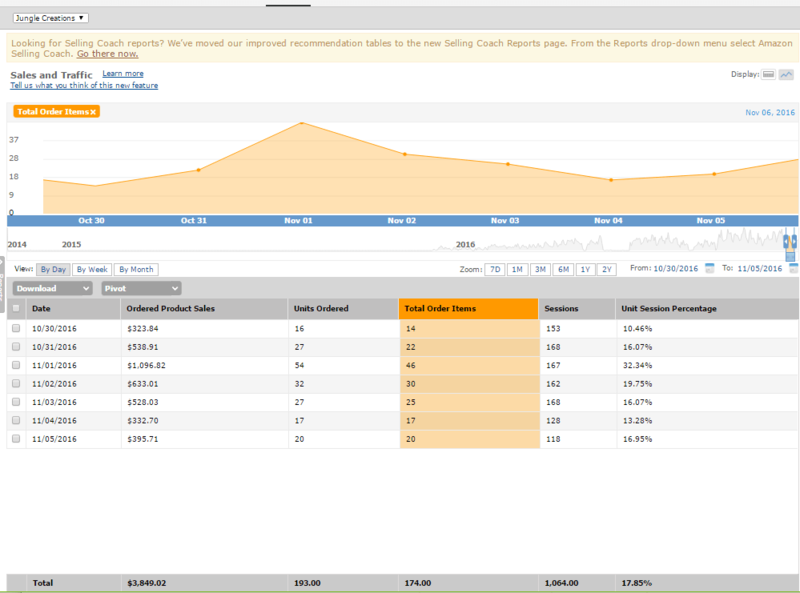 With our exact match campaigns, and strong bid, we are the top ranking sponsored product. 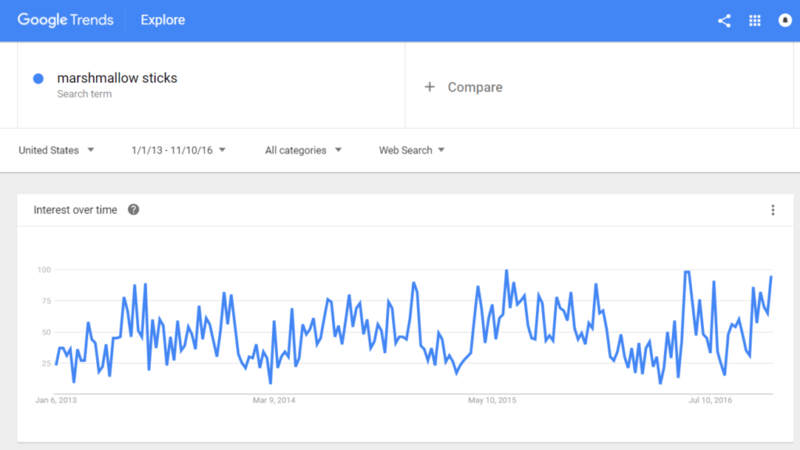 How Many Sales Come From Google Organic Search? How much traffic and sales are we getting from this? Well, it is hard to directly attribute any sales to this development in the Google Search Results. However, we can get some rough estimates. 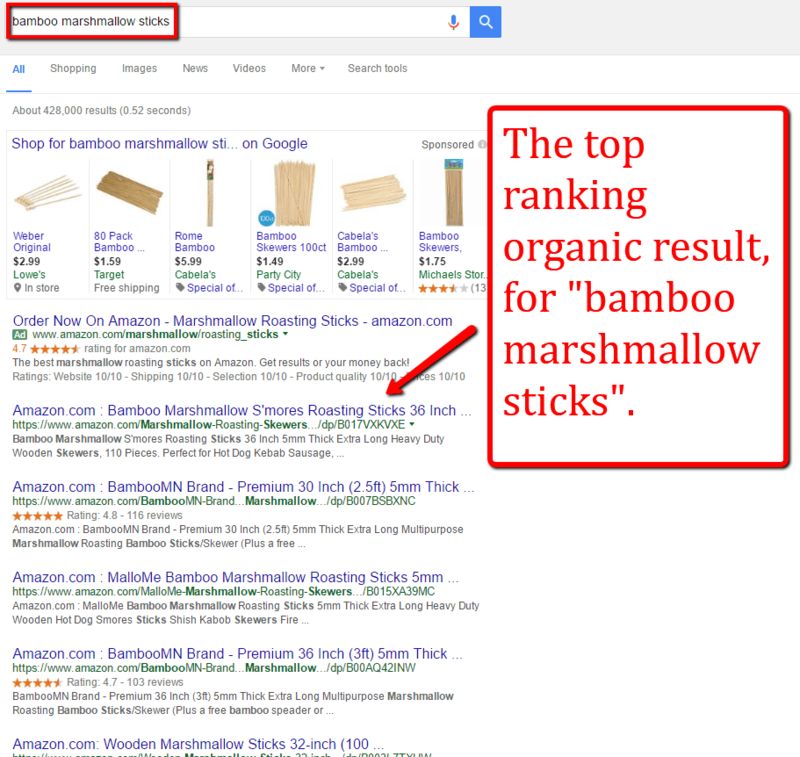 So with “bamboo marshmallow sticks” where we are the top result, with 90 monthly searches, we get 30% of those people—which is 27 people. Then if we take the conversion rate which we know to be roughly 18%, that is about 5 people. So we’re getting 5 extra sales a month from ranking in Google. 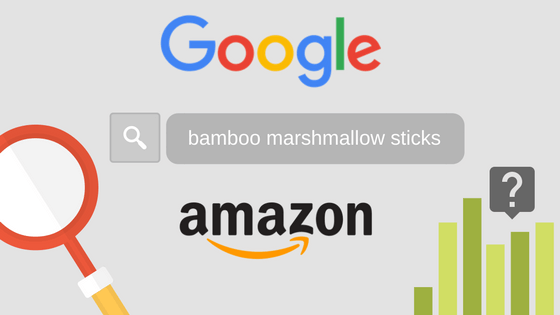 Apply the same logic for the search term “marshmallow sticks”. Google shows that there are 1900 searches per month, and we are ranking 4th for that term, which has a 7% Click Through Rate. 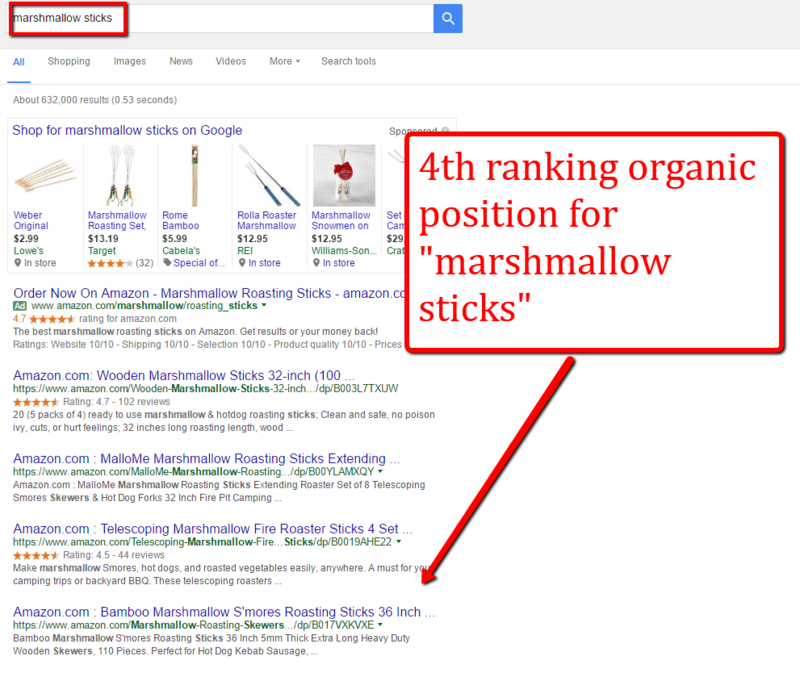 So approximately 133 people land on our Jungle Stix page from Google organic searches of “marshmallow sticks”. 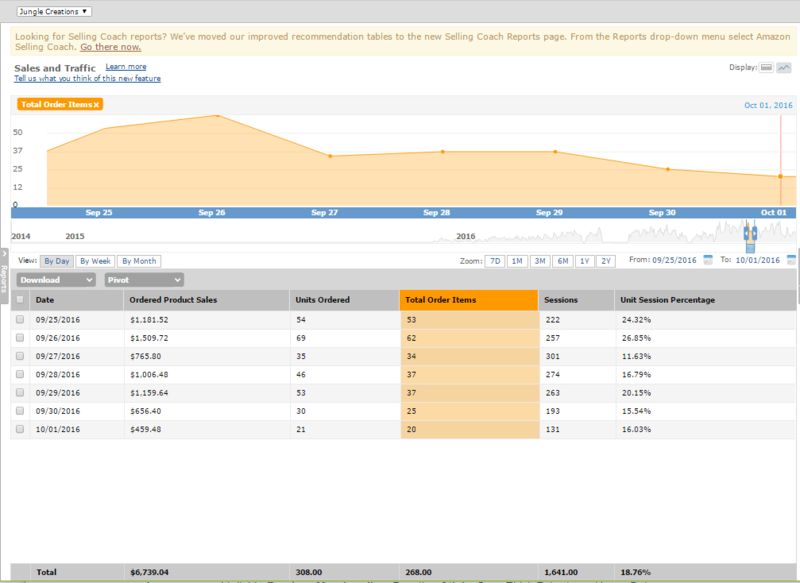 Applying the 18% conversion rate from visitor into customer, that is about 24 customers a month. Not bad! 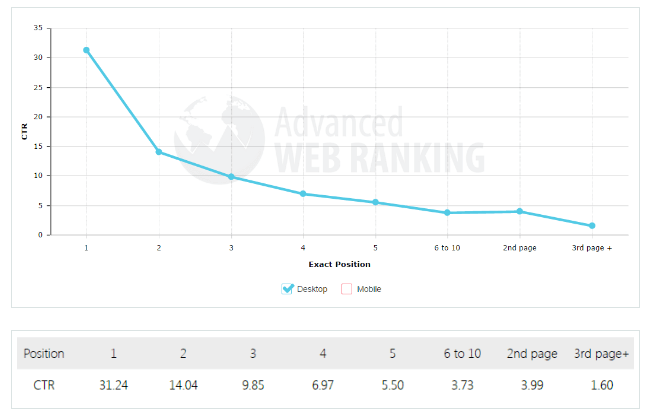 How Did We Get Our Google Organic Ranking? Using Ahrefs (an SEO back link tool), we can see that there are 16 backlinks from 7 referring domains. If you look at these backlinks, many are from websites with decent authority (such as Jungle Scout, inspiredinsider.com, thatchicmom.com). Why is the Jungle Stix Amazon page ranking above other Amazon pages? 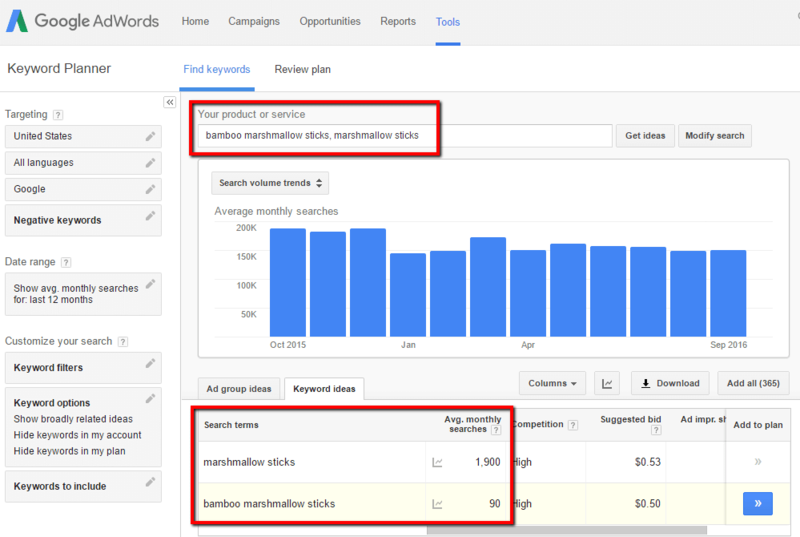 At a high level, we have more product reviews, more backlinks, and are therefore ranking for more keywords. So overall, October was a good month for Jungle Stix. On a surface level, we may have endured a bit of a hit with some lost product reviews, but the conversion rate did not decline significantly. We will keep an eye on this and update when we have more data. I am hoping that we will see month-over-month growth in November and December to finish the year on a strong note. 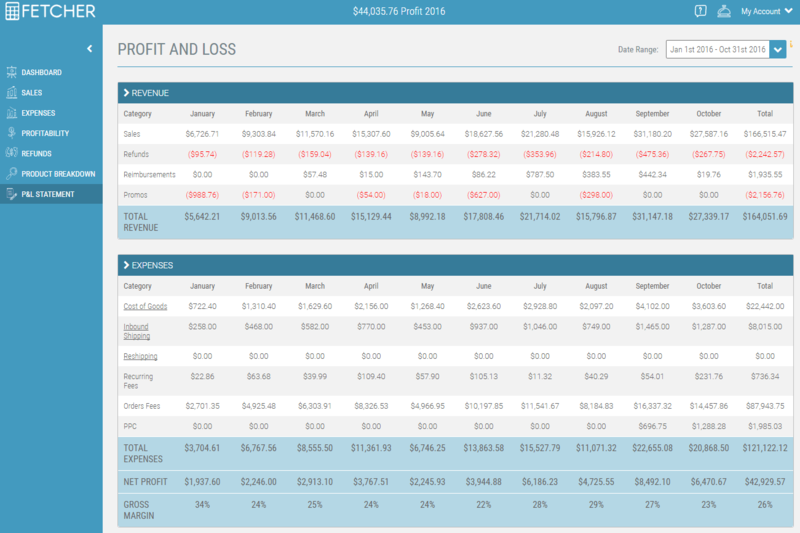 I am also currently running a lot of pricing split tests to see if I can home in on the profit-maximizing price point. What can regular people do to rank in google organically since you mentioned some of your success is due to linbacks to sites with authority like your own site. The best thing to do is just reach out to those in the same marketspace as you. Ideally, you should build a list of 100 contacts and try to touch at least each of those contacts once a week. Not all will reply and some will say no, but you’ll eventually get some yes’es and links. Can you tell us your ‘shipping cost per unit’ for jungle stix? Thank you! I would recommend checking it out again as Gen made some excellent points. But in a nutshell, yes you could look to getting your packaging done with a third party you trust, not your manufacturer. This normally means finding a packaging and prepping service in the country of sale (once the products have been imported). This does add a layer of complexity and cost though, so another route it to be super careful when finding manufacturers and developing really good relationships with them. Is the label on the Jungle Stix shown with the recipe and warning the only label on the product? How much information do you put on the labels? How much information is required to be on the label, such as UPC, weight, suffo/choking labels, addresses? Do you hire a separate design artist to create the label or use the China manufacturer’s resources? Is this amazing tool works on amazon.co.uk? The Chrome Extension works on Amazon UK (as well as Germany, France, Canada), however the Web App currently only supports Amazon US. Hope this helps! I have a product with some words on the front page. But for the main word I am in position 6. Which takes away many sales. What can i do? I have the bid twice as much as I need. But I do not have many impressions… I have more images than my main competitor, etc. I’ve tried everything. I have half of reviews that they have. Otherwise, try editing your back end keywords in Seller Central, and try some follow up emails to your customers to get more product reviews. Hope that helps! thanks Greg informative post. I wondered where all this was going at first I though junglestix was a peice of software you had been selling. then as I’m thinking why is he telling us this. I remembered you did this example product last year. good work. I don’t admit to understand all of it but interesting non the less. Glad that it helped. If anything is unclear or confusing, just drop a question in the comments and we’ll make sure to answer it! Best of luck!